About 250 miles northwest of Nairobi, Kenya, the sun rises over Luucho, a quiet village nestled between large granite boulders. At the centre of the village, there is an outdoor market where three orange, dusty roads intersect, bordered by thick and thorny vegetation. In the morning, the market begins to stir as the first of the vendors arrive to unlock their booths and restock their shelves. Later in the day, the vendors will be busy counting change and wrapping items in recycled newspapers. Until then, they work quickly to prepare for their customers and try to stay out of the sun’s increasingly punishing heat. 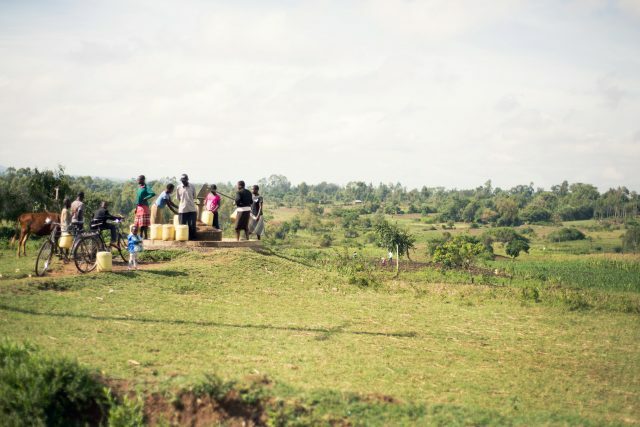 Residents of Luucho gather at a water pump to collect water to take to their homes, most of which do not have running water. On the outskirts of the market lives 66-year-old David Wanangeiye, one of the village elders responsible for solving minor disputes in the community. Also trying to escape the sun’s wrath, David takes refuge under a lone tree outside his mud-walled home. A woman farms her rocky field in Luucho, Kenya. Like many smallholder farmers in Luucho, David depends solely on the rain to water his crops. In an ordinary season, the rains start somewhere between late February and early March with most farmers planting seeds by mid-March. This year, the fields sit empty, waiting, while farmers anxiously await the return of the rains. It’s now late March. Ironically, lack of food is a common struggle for farmers in western Kenya. The majority of farmers run out of food three to four months after harvesting, leading to a period of food insecurity that lasts until the next year’s harvest is mature. This period is commonly referred to as wanjala in Bukusu, the local dialect; it means “hunger season.” During this time, farmers and their families will rely on a cup of tea or porridge in place of a meal. Wanjala is still vivid in Shalene Simiyu’s mind. Shalene lives about 300 feet east of David’s home and could never grow enough food to make it through the entire year. Usually, Shalene managed to harvest just one bag of maize from her half-acre farm, and this single sack of food would only last her family of six for two months. For the rest of the year, her family would be limited to one meal a day. “When we had no food in the evening, I would give my children a cup of water and then ask them to go to sleep. But they could not sleep because their stomachs were hungry, so I had to stay awake the whole night trying to calm them down,” Shalene says. One Acre Fund field officer Salate Oteba hands out planting trainings to Shalene (far left) and her neighbors as part of a One Acre Fund crop training. In 2009, Shalene bought seed and fertiliser from One Acre Fund, a nonprofit social enterprise that delivers farm inputs on credit to farmers in remote areas of East Africa and trains them on how to increase farm productivity and income. Armed with new agricultural knowledge and supplies, Shalene increased her harvest that season to an astounding eight bags of maize. With this food, she was able to defeat the hunger season and feed her family for the full year. Since then, she has continued to improve her crop yields and says she even has a surplus that she can share with her neighbours. Shalene Simiyu and her daughter Lenise Nafulasit together in their house in Luucho. At half past noon, a distant gong signals lunchtime at Luucho primary school. As her children arrive home, Shalene quickly moves to the kitchen and starts serving a meal of rice and beans. She is soon joined by Christine Nanjala, her immediate neighbour and friend. The two friends chat happily as they arrange the plates on the table. Residents of Luucho travel primarily by foot or bicycle. According to Christine, a meal of rice and beans is common for this time of year in many Luucho households. Since the onset of the dry season three months ago, green vegetables have become scarce and expensive. Villagers now depend on other foods that can be dried and stored, and beans fit the bill. “During the dry season, all the farms in this village are empty, so our options become limited. I’m looking forward to the start of the rains because then there will be plenty of fresh vegetables in the farm for us to choose from,” Christine says, Shalene nodding in agreement. Shalene’s children (from left) Laban Wanyonyi, Mark Wekesa, and Getrine Nasimiyu eat a lunch of rice and beans at home in Luucho. Shalene and Christine clear the table after the children finish lunch, and the two women prepare to head out in the heat to the market where Shalene sells clothes, fish, and mangoes. Unlike the morning, the market is now abuzz with activity. Sellers and their customers bargain to get the best price. Music booms from several shops, and a growing line forms at the cereals mill, where parents wait their turn to grind grains into flour for porridge. Unexpectedly, a cool breeze sweeps through and the whole market pauses for a moment. Everyone looks to the sky, hoping—perhaps today will be the day when the rain finally returns. Want to know if the rain finally falls over Luucho? Check back next month for part two of this year’s harvest series.